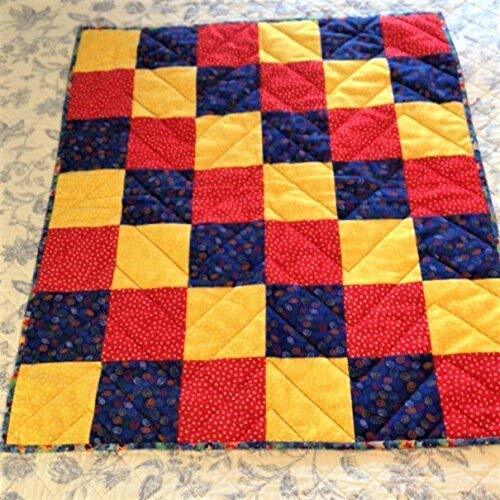 Cuddly and cozy cotton flannel quilt in bright primary colors of red, yellow and blue with a solid red flannel backing. Hand finished with a double bias cotton binding of colorful stars. The batting (filler/wadding) fluffy 100% polyester. The quilt measures 27" x 30" and is an excellent choice for the bassinet, cradle, cover for the car seat, or to carry along in the diaper bag for a diaper change or impromptu nap. The quilt is machine washable and dryable. In stock ready to ship. Free Shipping on this quilt. If you have any questions about this product by Pinewater Quilting, contact us by completing and submitting the form below. If you are looking for a specif part number, please include it with your message.